The race ended four laps early when Ben Wylie's spinning bike took out Philip Crowe. Racing on temporarily constructed street circuits is much more dangerous than on purpose built tracks, which is why it is so rarely done anymore. 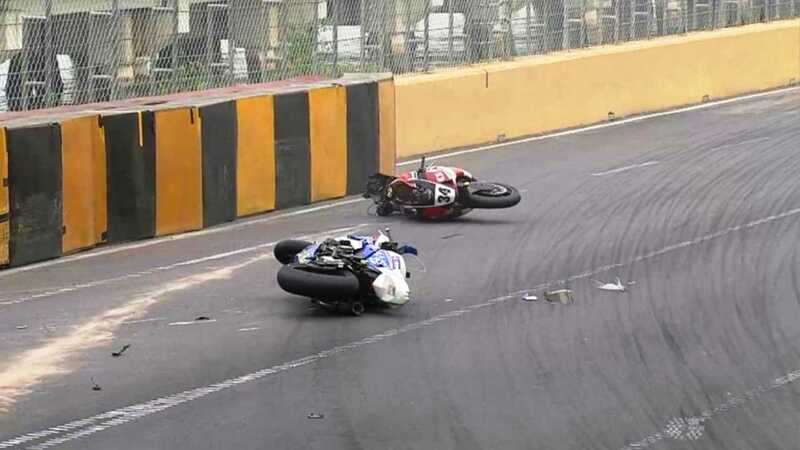 That was proved once again as the Macau Motorcycle Grand Prix ended after just two-thirds of the laps were run, due to a crash taking out two riders and scattering bike parts all over the track. In 2017, the race ended at the halfway mark when a crash in the same corner, known as Fishman's Bend resulted in the death of rider Daniel Hegarty. Peter Hickman was declared the winner, making this his third win at the technical and dangerous Guia Circuit, and giving him a clean sweep of all the international road races this year. Michael Rutter was declared the second place finisher, though he and Hickman were still in a close battle for the lead with 4 laps left, and Martin Jessopp got third. The race was ended when Ben Wylie went wide in Fishman's Bend, one of the most difficult corner on this tight circuit built in the city know as the "Gambling Capital of the World". Wylie bounced off the armco barrier, and him and his Bimota race bike went sliding and spinning down the track, where Philip Crowe's BMW struck it and also went down. Crowe was checked out and released, while Wylie went to the hospital with a possible broken collar bone. Things did not go so well during the Macau practice sessions on Friday, where Andrew Dudgeon and Raul Torras both crashed, cutting practice short. 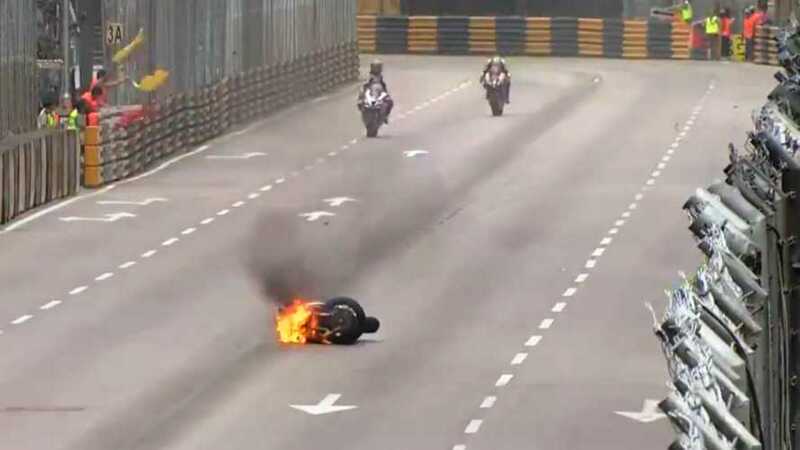 Torras, who's BMW S1000RR race bike is seen in the video at the top bursting into flames, is still in the hospital with a serious head injury (sub-arachnoid hemorrhage and frontal scalp hematoma) and broken collar bone after running wide in Mandarin. Andrew Dudgeon was found to have fractured his L2 vertebra, when brought to the hospital, but still managed to crawl to safety off the racing line after the crash. 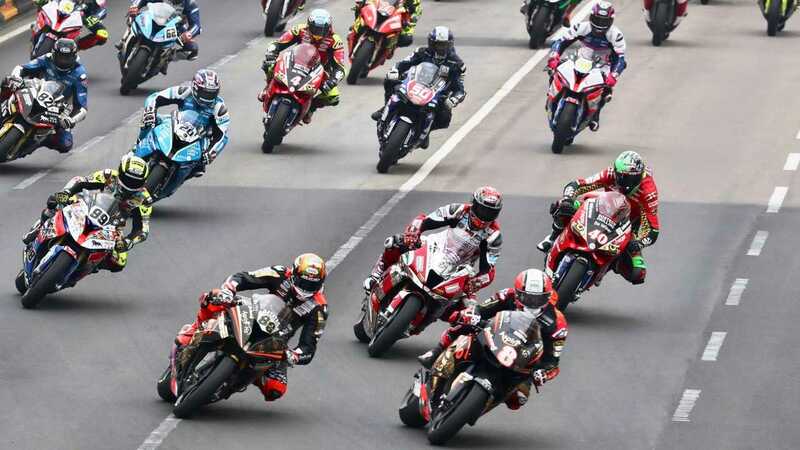 Crashes, tight racing, and the unexpected are what people have come to expect from street circuits like Macau, the Isle of Man, and other real road races. Macau is somewhat unique, with motorcycles, Formula cars, and sports cars all racing the same circuit in different races on the same day. A stray dog wandering onto the track nearly ruined the Formula three qualifying race earlier.